Hey, you recently learned my proven 3-step process for getting private money. The response was awesome… that video has been shared over 2,400 times and has over 645 comments!! Now that you understand the most effective private money getting process, what stands in your way of success? In today’s in-depth video training, I break down each fear and give you practical strategies to conquer ‘em once and for all. We ALL must face these fears… but while most people allow themselves to become immobilized… others use little techniques and tricks to face them head on. Leave your thoughts, questions, whatever is on your mind in the comment area below. AND show some love… share this post before ya go. Thanks! P.S. – As I mention in the video, we’re doing something a bit crazy that I’m gonna let you in on very soon. I have a feeling you’re going to like it… well, actually you’re going to LOVE it! You’re welcome man. We’ll get the template sent your way soon. We love your Private Money Blueprint. Thanks for the videos- they are filled with up to date techniques & strategies. Also enjoy the way you present in a nice calm informal tone. Can’t wait to share. Hey, that’s great to hear. If there’s anything I can help you with, let me know. Very good information Pat, thanks again. I am looking for $35,000 cash to obtain $15,000,000 loan to purchase a shopping center with a NOI of $1,377,711 per year. Loan 3% fixed for 30 years. I had business in shopping centers for 25 years and commercial Buildings for 12 years. 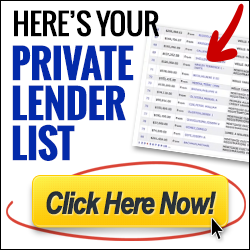 I will pay the private lender $45,0000 at closing and $60,000 in 6 months or less. It could be at closing. About $6,000 will be used to set up 3 coperations. Two Nevada Corps and one CA corp. I am a PMBP member and trying to locate this interview on the site and cannot seem to find it. Could you please assist? Again – good stuff! Thanks. Even though $42k isn’t a huge amount, it’s a good start. Often times, once you bring a private lender on board and show them a good return, they invest more with you… and give you referrals. I left a comment on the last video asking for the Loan Scenario Template, but I haven’t received it yet. Can you please send it! I sent your info to our Chief Member Experience Gal, Charity. She’ll send you the template soon. I listen to JR almost every day. that was awesome that you put it into your words. since PMBP i have been rocking it, raised almost a million over the last 4 years but this last November I changed my mind to really make a biz of this and am on track to put a 10 million $$$ fund together this January! Please keep us posted. We love hearing member success stories! Hi Patric. Thank YOU for your videos.They are perfectly done. I love to listen to YOU and make notes. I look forward to more videos. Thanks for the kind words Lyudmila. If I can help you with anything, let me know. Dear Patrick: Great Video. All true. Hi Patrick, Another “home run” video. Thank you so much. Please keep them coming. Nice connect the dots approach. Looking forward to the rest of the series. Awesome as usual, I could not stop watching and would like to listen again. Thank you, this definitely will help. Great information Patrick. Your the man!! Thank you for sharing….this is powerful stuff. Great stuff…simple and easy to implement! I can hardly wait to see it and take your words in this video into action. Thank you for sharing your knowledge and experience, I am truly grateful. This is a timely email and post, just what I need to bring in the new year and a new me… Thanks Patrick. Patrick, several months ago, I was introduced to a couple of ‘ investors ‘. One is a licensed real estate agent and the other is an investor in the ‘sweat ‘ equity frame of mindset. I’ve been a ‘ birddog ‘ for them not received any monetary compensation. I send them viable/potential deals. I expect to be paid for my work, driving , recording addresses, areas and other data. With one, I was in the mix with 4 others redoing a small trailer. I painted a small bathroom, 2 coats which as I pointed out had work 2b done but….. anyway that’s one situation but I still phone them giving them addresses, locations and other info. Not been paid. The last one I talked to wanted me to do all but going and making the offer. What is the duty of a birddog ? Should I be paid for my effort in ‘giving ‘ them leads of potential deals / profits or should I ditch these guys to find a more appreciative investor ? In all, I may have lost several thousands for my efforts. What are your thoughts on this ??? Thank you for the motivational video about fear–we all have it; now it’s nice to know ways to conquer it. You’re welcome, Christine! Let us know if we can help with anything along the way. Nice job. Looking forward to using these great tools and proven methods in my own business. Thanks for sharing! You’re welcome, Nick! Glad you enjoyed it! Patrick, that was really powerful, not just for investing but for all aspects of life; awesome! RE fear of the unknown & stepping outside one’s comfort zone is akin to stepping outside the box. I think of getting outside my box is to take a calculated risk into FREEDOM! But outside the box (as I imagine it) is to view other asteroids where we all have our own peculiar shape and unique components. Also, we are all in orbit around the sun in similar trajectories. That sun is the achievable goal of time and money freedom – some warmth, huh? Another confidence analogy (stated years ago by ?) is to remember that the other guy puts his pants on the same way I do – one leg at a time. Looking forward to your next vid! Hi, Patrick and thank you for such great tips. Honestly, I am currently dealing with all three type of fears. But I know now how to handle them. Also , how can I receive the loan scenario template? thanks a lot. Having 12 years of experience as a real estate investor has taught me one special thing, don’t ever pass up new ideas or valuable information. I make it a point to read at least one real estate book every week and listen to at least two webinars every week. I attend RE Club meetings regularly and RE seminars when an interesting one is scheduled. I find the information and educational value of your presentations to be among the best. Thank you. I look forward to receiving the template. Thank You for the video that explains about how a private lender . Thank you for addressing the three fears. I like what you said about the law of averages. The thing that I’m really wondering is how to find and approach a potential PML. Would you share some techniques on that? Thanks, Patrick! Awesome content. Thanks for sharing. Please send the template. Look forward to implementing. Please send me the template. Please send the template,very interesting. Great video, looking forward to upcoming suprise and also the template!! Looking forward to using your money template. Great presentation. Thanks for sharing your knowledge. The email address is different from the one I used when I purchased the program. I enjoyed the motivational talk, but am a little confused as to what the private money template is. Is it a script you will email out with a list of private money lenders or was this a promo to buy something else.